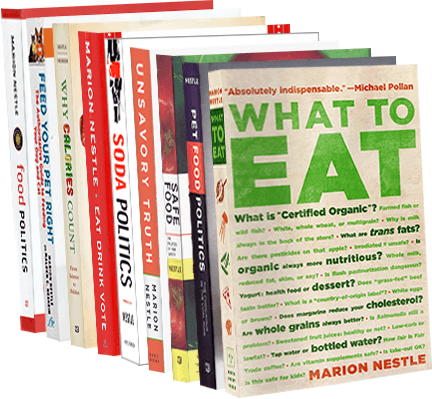 Food Politics by Marion Nestle » Q: What is your opinion about (fill in the blank)? Q: What is your opinion about (fill in the blank)? My monthly (first Sunday) column for the San Francisco Chronicle appears today. This time, I caught up with some questions. A: Questions have been flooding in lately asking what I think about one or another food or nutrition topic under current discussion. I ordinarily don’t respond to them because any reader of this column should be able to predict what I’m likely to say. Occasionally, some misunderstand, so let’s deal with some clarifications. A: Of course I favor plant-based diets. Such diets are demonstrably better for health and kinder to the environment. But plant-based does not necessarily mean vegan, which entirely excludes animal products. This quotation appears to come from vegan websites, not the United Nations. The U.N. report notes that animal agriculture contributes to climate change, but says nothing about dietary advice or vegan diets. Kaiser Permanente urges physicians to advocate “eating healthy, whole, plant-based foods (primarily fruits and vegetables) and minimizing consumption of meat, eggs and dairy products.” Minimize is not the same as exclude. Q: You haven’t said anything about the genetically modified wheat found in Oregon. Don’t you care? A: I haven’t written about this incident because I’m waiting to learn how the wheat got there. GM wheat is not approved for planting anywhere, and it’s been nine years since Monsanto grew its last test plots. Without more information, I can only speculate. Has GM wheat been growing ever since? Did the seeds suddenly germinate? Were they mixed with conventional seeds by mistake? Monsanto has its own explanation: sabotage. The need for a true explanation is urgent. Several countries have refused to accept shipments of American wheat unless it can be certified GM-free. Q: Just like everyone else, you don’t write much about food safety. Q: You claim to be some kind of expert on the farm bill. Explain what just happened. A: Expert? Nobody can be expert on the farm bill. It’s too big and complicated for one person to understand. Lobbyists, advocates and some congressional staff may know parts of it thoroughly, but the whole thing? Hopeless. I taught a course on the farm bill a couple of years ago – a depressing introduction to the worst of American politics. Anyone can figure out what agricultural policy ought to do: promote production of adequate food at an affordable price, provide a decent living for farmers and farmworkers, protect the environment and promote health, for starters, but this is a large order for any piece of legislation and impossible for our current Congress. The House failed to pass it, mainly because Republicans thought cuts to SNAP, food stamps, weren’t deep enough and Democrats were appalled by the size of the cuts and by new requirements for drug testing and work. I have no crystal ball for seeing how this will play out, but I’m not optimistic that this Congress will do anything much for new farmers, small farmers or fruit and vegetable producers. Q: Why are you so hard on nutritional supplements? You must be one of those people who thinks they kill people. A: Don’t get me wrong. Nutrient supplements are great for people who have nutrient deficiencies. Whether they make people worse is arguable, but study after study shows that nutrient supplements do not make healthy people healthier. If you like to take supplements, I’m guessing you don’t care much about what the science says. Supplements aren’t about evidence-based medicine. They are about deep distrust of modern diets, science and the health care system. If nothing else, supplements are powerful placebos, and I’m not at all convinced they are seriously harmful. My advice: Supplements, like everything else about nutrition, should be taken in moderation.